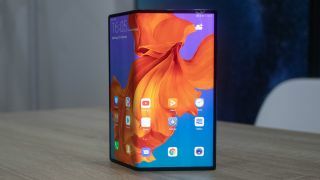 Although it was beaten to the punch by the Samsung Fold (and the Royole FlexPai if you're feeling charitable), Huawei threw down a major gauntlet earlier this when it unveiled its Mate X foldable handset, delivering what is arguably the most appealing folding smartphone design to date. Now, it appears the company is going all-in when it comes to foldable smartphones, with Huawei CEO Richard Yu offering some refreshingly frank comments about the technology in a new interview with GSMArena. When asked about how many foldable devices it could have in its stable over the next few years, Yu said "I think that on a flagship level in two years, half of our devices could be foldable." Of course, the CEO is more than aware of how expensive its first attempt at the technology is, stating that "folding phones are just in the beginning and the market share is small, they cost a lot and it's very expensive to produce such devices." However, Yu believes that the cost will reduce significantly over time. "I think in two years foldable phones will have a similar price to current flagship phones," said Yu. Revealing that his primary handset at the moment is the still-in-development Huawei Mate X, Yu also discussed the just-announced P30 Pro, stating that "In the future we can make a foldable phone sized in half of this one [P30 Pro], we have plans for a smaller foldable phone."